RVU will honor and celebrate military personnel from the RVU community on both campuses. RVU-CO will host their 8th Annual Military Appreciation Ceremony on Thursday, October 4th from 5 – 6 pm. Tribute will be paid to fallen members of the five services and civilians during the Missing Man Ceremony. There will also be a special presentation given by Strategic Operations, architects of the Cut Suit® and providers of military and medical training to over 800,000 service members. 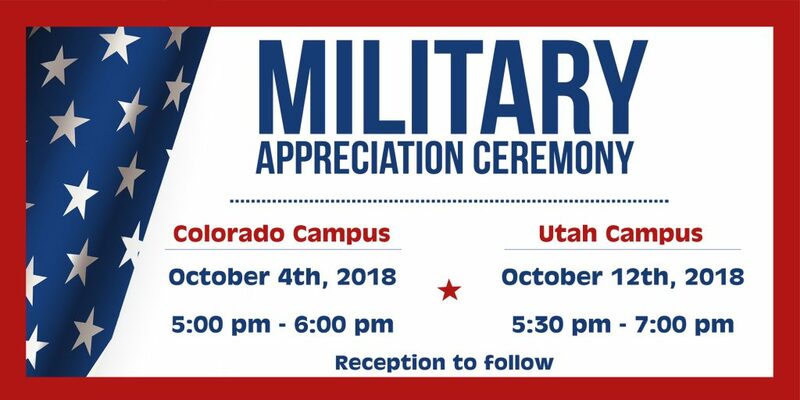 RVUCOM-SU will hold their 2nd Annual Military Appreciation Ceremony on Friday, October 12th from 5:30 – 7:30 pm at the Southern Utah Veteran’s Home in Ivins, Utah. The ceremony will recognize and celebrate medical students, physicians, and other healthcare professionals in the military. Ginamarie Foglia, DO, MPH, FACP, Director of the Military Track and Professor of Primary Care, will be the keynote speaker.